Description: Sexes similar. Black crown with bright yellow central crown stripe; grayish cheeks and throat; bill is dark above and pale below. 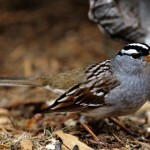 Brownish back is streaked with dark brown; grayish-brown unstreaked breast, sides, and flanks; whitish belly. Winter adults are duller overall. 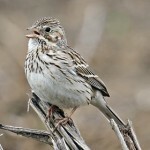 Juvenile has indistinct yellow crown patch, and dark streaking on breast and sides. Habitat: Usually found in alpine meadows, coniferous forest clearings, and in open areas near the tree line. 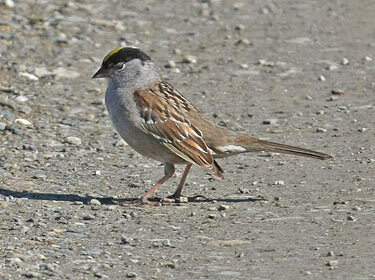 Field Notes: Often joins flocks of White-crowned Sparrows during the winter. Seen less often in urban and suburban areas. 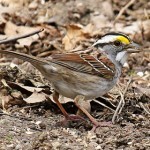 Fun Facts: Golden-crowned Sparrows will scratch out depressions in the ground for their nests so the rim is even with the ground.